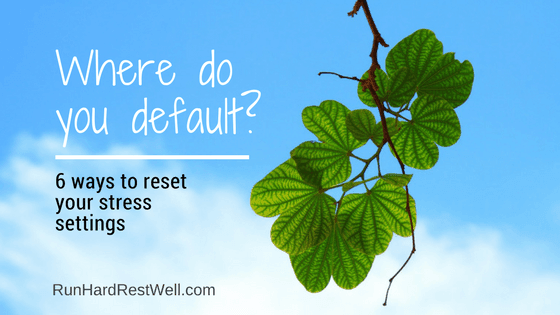 Where do you Default? • Run Hard. Rest Well. It damages the cells in our body and shortens our life span. Breathe. Americans are famous for shallow, anemic breathing. Just a few, slow, deep breaths trigger the vagus nerve—every time. This signals the nervous system to lower the heart rate, which in turn helps the body recover from an overdose of cortisol. Tape up some breathe! sticky notes or set a timer on your cell phone. Bedtime and red lights are great places to practice. Experts tell us there’s an art to breathing well. Begin by exhaling out through your mouth. Then take a slow breath in through your nose. Don’t go too slow or too fast. Breathe at a normal rate, just make it sure it’s deep. Try to use your abdominal muscles and if you’re sitting upright, don’t allow your shoulders to rise. Make sure they’re relaxed. Five to ten will serve you well. Hold and hug. Wrap your arms around people you love. Every day. Human touch reduces cortisol levels. It’s life-giving to premature babies and just about everyone else. Kissing works, too. Linger outside. Meander to your car. Most Americans spend only 14 minutes outside every day, the short bursts we spend walking from a building to our car and back again. This cortisol reducer simply encourages us to pause and pay attention. Feel the breeze, the rain, the sunshine. Listen for birds. Notice the clouds, a splash of color, the dance of leaves or branches in the wind. Attend. Then take a moment to marvel. And if you see a rose . . . well, you know what to do. Smile. Simply smile. (Laugh, too, every chance you get.) A genuine smile reduces your heart rate even in stressful, multi-tasking situations. Go figure. So, shine those pearly whites at every person you meet. If they’re under five, add a wink free of charge. For an interesting read about smiling and cortisol, take a look at this Smithsonian article. • Thank the Lord. Every night. Three things. Be specific. Ann Voskamp encourages us to make a list of 1,000 things. A year of gratitude goes a long way. Begin tonight. Better yet, begin right now. Chronic Cortisol is a killer. If it was not for God’s rhythms of rest I would have been dead a decade ago!! His ways bring healing and health. God had a Jacob-sized wrestling match with me … but He won! A life of rhythm and restoration blesses us with never-ending rewards. Thank you! I’m breathing! No one really to hug. Will the cat work? Well, cats are…..well, cats. I will try going outside. With breathing issues, and the allergies out there….it can be hard, but it’s worth a little time outside. I have to be careful of the sun due to the steroids, but I can get around that, too. It’s exercise I need and a different kind of noises….much to see. Even little things like picking up sticks. Remember “5 6 pick up sticks”? Laugh…..Jeanne Robertson has some great video comedy skits. She can bring a smile or a deep gut laugh. We’ll beat this. It’s God’s promise and I thank Him for you.